Heavy duty cranes and slings used to position the sculpture on the base. 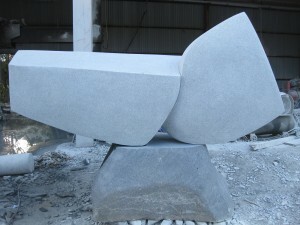 So 3 days work left to finish my sculpture. Polishing, polishing, polishing. I had the stone laid on its side today to make it easier for me to work on. Then of course the sculpture has to be moved onto a black granite base which I have already selected. Big tyers had to be laid on timber logs to cushion the fall as the stone was moved into its new position. 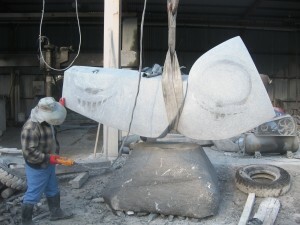 A mobile gantry with a very large hook was used to the piece into position. 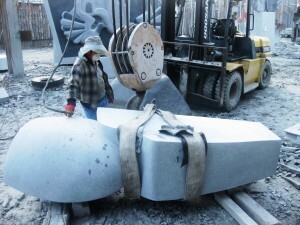 Great to watch the care taken when the artisans move the stone. Amazing that the work balances so well on such a small surface for such a big and heavy stone; heart in the mouth experience. 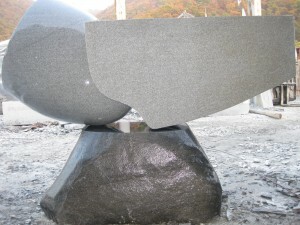 Base reduced slightly in height so that the sculpture sits more comfortably on the base.